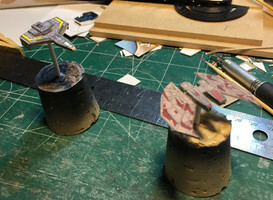 Adm_Maverick has posted further instructions on how to turn his simple WC fighter templates into small cardboard miniatures. 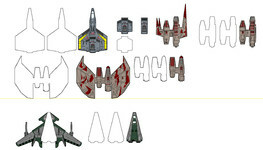 He simply prints out the artwork below, affixes it to plain cereal box cardboard, cuts the outlines and glues the final product together. The results, as previously shared, are astounding for such a simple method. It's a neat art project anyone can try! I just use cereal boxes for the cardboard. Just print out the templates on any half decent inkjet printer, use a glue stick to glue the template down to the cardboard. Let it dry... for like 12 hours. Then use an exacto-blade to cut out the parts. Any parts that are white with a black outline are just meant to build up body mass. So if you look at this image, I've numbered the parts for reference, and then look at this image where I've laid out a mock-up of layers to show the order the parts should be built up in. 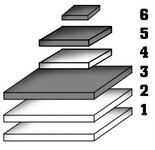 The white layers are the parts that are white with black outlines, while the grey parts are the colored parts.